Chessfunda: Mate With Two Bishops. Pin It Sometimes we reach the situation where endgames become very tedious and we feel we should stop game here and declare draw. But playing such games and practicing for it is more interesting than any other endgames. Here is one of the most facinating endgames. 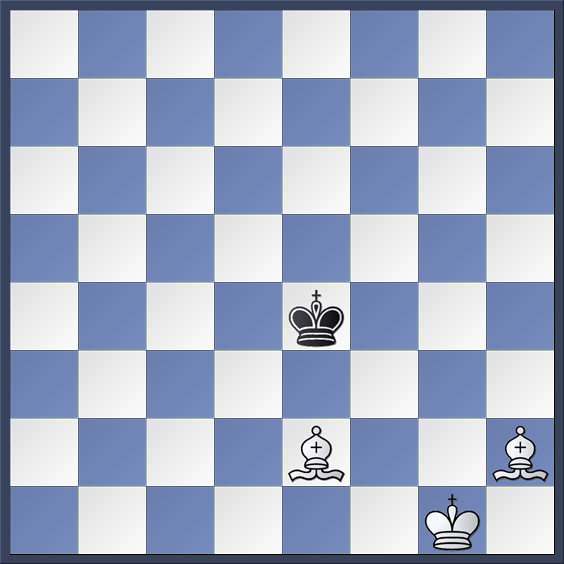 Mating with two Bishops requires the king is to be shifted to the edges of the board, not only to the edges of the board but to the corner of the board. Is it simple to force the king to move to the corner of the board. If you think it is not possible then check it out how it works. Once you got the idea try placing two Bishops and Kings on the board and practice it. 1 Kf2 Kd4 2 Bf3 Kd3 3 Be5 Kd2 4 Be4 Kc1 5 Ke3! While trying to force the king to move to the corner be careful is will have a space to move otherwise it will be a stalemate. 5 ...Kd1 6 Bb2 Ke1 7 Bc2 Kf1 8 Kf3 Kg1 9 Bf5 Kf1 10 Bc3 Kg1 11 Kg3 Kf1 12 Bd3 Kg1 13 Bd4+ Kh1 14 Be4 Mate. It is very important that the kings opposition is to be maintained every time the opponents king move. You may like to read the following articles. One move from the ideal square.